The decision by Brandeis University to withdraw its plans to bestow an honorary degree on Ayaan Hirsi Ali came after one day of protests from groups like the Council on American-Islamic Relations (CAIR) and the Muslim Students Association. Both groups have documented roots in the Muslim Brotherhood, which seeks global Islamic dominance, a reality neither is willing to acknowledge. Hirsi Ali, born and raised into a Muslim family, renounced her faith and chronicled her reasons why in two best-selling books. She has been targeted for death by radical Islamists, including in a note pinned onto the body of Dutch filmmaker Theo Van Gogh after he was shot and stabbed to death on an Amsterdam street. The two collaborated on a short film, "Submission," which was critical of the way women are treated in Islam. Hirsi Ali has made many statements critical of the religion, and her foundation works to protect women from physical abuse like honor violence, genital mutilation and forced marriage. Such a life, such a dedication to improving women's lives, is deserving of an honor like the one Brandeis planned. But the school reneged, issuing a statement which said it could not fulfill its promise due to "certain of her past statements that are inconsistent with Brandeis University's core values." The move comes on the heels of ABC Family's decision to scrub a new series about a teenage girl forced to live with extended family in Saudi Arabia. CAIR led the charge against "Alice in Arabia," saying it "may engage in stereotyping that can lead to things like bullying of Muslim students." Never mind that something quite similar to the show's premise actually happened. 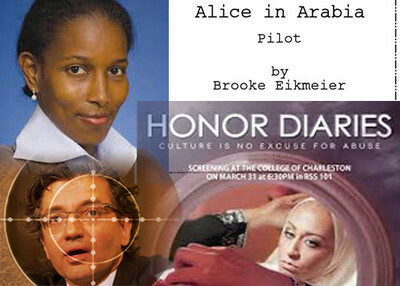 And never mind the show creator Brooke Eikmeier's belief that "Alice in Arabia" could be "a step in the right direction for all cultures and all women, sparking greater tolerance, understanding and empathy." CAIR squawked and ABC yielded. And just last week, screenings of the documentary "Honor Diaries" were scrubbed at two University of Michigan campuses and at the University of Illinois-Chicago after CAIR and other Islamist groups protested. "With this act of censorship," wrote practicing Muslim physician Qanta Ahmed, a participant in the film, "the movie has become a metaphor for its message. Just like the women and girls it portrays, the movie has been silenced and its progenitors shamed." Criticism from Islamists has focused on the film's producer and financers, not on its content. One Islamist critic, Linda Sarsour, honored as a White House "Champion of Change" in 2011, inadvertently made a point that shows the vacuous nature of the argument. If the finances were relevant, a Twitter poster suggested, perhaps the sources of CAIR operations warranted attention. "CAIR," Sarsour responded, "is not making domestic violence documentaries saving women." No one else is either. The one party who took up this legitimate issue has been pilloried for doing so. In none of these cases has CAIR or other Islamist critics expressed willingness to debate the issue. Instead, Brandeis is joined by a television network and two state universities in cutting off opportunities to challenge views on all sides of the issues involved. Isn't that the kind of intellectual pursuit universities are supposed to foster and embrace? So the Islamists are on a roll. Sami Al-Arian remains a hero in Islamist circles despite being exposed as a board member for the Palestinian Islamic Jihad and being taped saying Jews were "made into monkeys and pigs" by Allah and calling for "Death to Israel." CAIR represented Imam Kifah Mustapha in failed litigation against the Illinois State Police. The agency dropped Mustapha as its first Muslim chaplain after the Investigative Project on Terrorism reported about his work as a paid fundraiser for a Hamas front, including performances "singing about Jihad and martyrdom" in a singing troupe which performed at fundraisers. CAIR lauded University of California, Irvine students charged with misdemeanors for orchestrating a series of disruptions aimed at silencing a 2010 speech by Israeli Ambassador Michael Oren. CAIR's Los Angeles director called the students, whose stated goal was to silence someone else's speech, "true American heroes." CAIR has defended Muslim Brotherhood spiritual leader Yusuf al-Qaradawi as a moderate despite his fatwas justifying suicide bombings in Israel and attacks on American soldiers in Iraq. CAIR Executive Director Nihad Awad joined Qaradawi in 2012 to discuss a film project about the Muslim prophet Muhammad. This meeting occurred after Qaradawi expressed a wish to kill Jews before he dies. When a radical Muslim website threatened the producers of "South Park" in 2010, CAIR's national spokesman dismissed the significance, wondering in the Los Angeles Times if "they were set up only to make Muslims look bad." And now CAIR celebrates the Brandeis decision to back away from plans to honor Hirsi Ali, who, as mentioned, has lived with similar threats for a decade and seen how real they can be. In a statement issued Tuesday, CAIR called on Brandeis to rescind the planned recognition, comparing it "to promoting the work of white supremacists and anti-Semites." By Wednesday afternoon, less than a day after Brandeis yielded, CAIR was trying to raise money off of the episode. CAIR was joined by the Muslim Students Association in lobbying against Hirsi Ali's honor. "We see this decision as a personal attack on Brandeis' Muslim students, and as minorities at a predominately white, Jewish university, many of us feel isolated and unwelcomed," the Brandeis chapter's leaders wrote in a column for the student newspaper. CAIR's spokesman smeared Hirsi Ali as "one of the worst of the worst of the Islam haters in America, not only in America but worldwide." As writer Lori Lowenthal Marcus noted, Brandeis's newfound sensitivity toward the feelings of some was more difficult to find when it bestowed honorary degrees on playwright Tony Kushner, who called Israel's creation "a mistake," or on Archbishop Desmond Tutu, who "has compared Israel to Hitler, attacked the 'Jewish lobby' as too 'powerful' and 'scary' ... and he complained of the 'Jewish monopoly of the Holocaust.'" If Brandeis had second thoughts, it could have organized programs for students and faculty to debate the issue of recognizing Hirsi Ali, but also about the issues she champions – the treatment of women in Muslim-majority societies. It's not likely CAIR, the MSA or other Islamists would have accepted this free exchange. Yet my critics have long specialized in selective quotation – lines from interviews taken out of context – designed to misrepresent me and my work. It is scarcely credible that Brandeis did not know this when they initially offered me the degree. On Fox News Wednesday night, Hirsi Ali called Brandeis' explanation "a very feeble excuse." School officials may have feared the repercussions of proceeding with the honorary degree and letting her speak to students. It's a mistake, she said, because, "To become American is to accept the idea that you can have a robust debate. And there's no other place better to do that than on university campuses." At Reason.com, where Hirsi Ali gave an interview in 2007 that was cited this week by her critics, editor Nick Gillespie wrote that he didn't agree with Hirsi Ali's "unqualified condemnation of Islam." But he also calls her "relentlessly interesting and provocative" and reserves far harsher judgment on Brandeis for claiming ignorance about her views and for caving in. "There is something particularly appalling about an institution that is predicated upon the idea of free and open discourse throwing in the towel so quickly," Gillespie wrote. "Either the people running the school there are simply total ignoramuses or they are cowards who refuse to defend their choice. Of course, they could be both." Writing in The Telegraph, author Toby Young similarly called Brandeis out for "an act of extraordinary cowardice." "To accuse Hirsi Ali of 'hate speech, which is defined as 'any speech, gesture or conduct, writing, or display which… may incite violence or prejudicial action against… a protected individual or group', is almost comically ironic," Young wrote. "She was raised as a Muslim in Somalia, underwent circumcision at the age of five and was later forced into an arranged marriage with her cousin. She only escaped this fate by running away to Holland where she subsequently became a member of the Dutch Parliament." The tactic of crying "Islamophobia" to silence ideas and people they don't like is nothing new for Islamists, especially those in CAIR. Our film, "The Grand Deception" devoted a segment to it. CAIR's Los Angeles director, having never seen the film, still wrote an op-ed in the Orange County Register saying it "serves to perpetuate that Islamophobic framework." When IPT Executive Director Steven Emerson offered Hussam Ayloush a chance to meet in person to discuss specific aspects of the film, Ayloush went silent. Anti-Islamist Muslim Zuhdi Jasser hears the same sound of silence when he challenges critics to debate. Jasser, a physician and Navy veteran, runs the American Islamic Forum for Democracy. He's proud of his faith, but sees it as a personal matter, not one meant to dominate society and politics. CAIR can't stand him. It opposed his appointment to the U.S. Commission on International Religious Freedom. That didn't work, so now the campaign has shifted to trying to get Jasser ousted. Too often, claims of "Islamophobia" are parroted without challenge by the news media. None of the reports this week pressed Hirsi Ali's critics about the context of her statements or about the overall tenor of their attacks. None pointed out that internal documents discovered during an investigation into a Muslim Brotherhood support network place CAIR on the group's "Palestine Committee." The committee was tasked with helping Hamas politically and financially. Until that situation changes, the Islamist winning streak of bullying others into silencing their foes is likely to continue. Brandeis officials may be dhimmies or fearful--or they may "simply" or mainly be massively non-informed about the War against us. It took me years (off and on) to find and digest the true story (which is indeed that "World War IV" for a global caliphate is underway--III being communism, II Nazism). Stay tuned--which will emerge? A "critical mass" of awareness in U.S.A., or CAIR etc. continuing Subversive Jihad effectively? The education cartel, and especially the Joos of the education cartel, had better make up their minds about which side they are on, and do it soon. Any more victories for islamic savagery and these typical examples of defective liberal protoplasm are going to wake up some morning to find a sharp jamiba slicing into their chicken necks as a reward for their undying support of primitive islamic causes. I suspect this is the same genetic defect in the thought process that kept so many European Joos from bugging out when bugging was an option. Same genetic defect. Different Joos. is not tolerated at all. With the Muslim students private clubs on campuses all over the US that practice on a daily basis their hatred for the Jewish students you would think the college administrators would see what is going on and disband the student organizations, but they won't. Once Obama is out of office at least the Muslim Brotherhood employees will lose their jobs and the FBI can have their training manual reprinted with the information they need to track down terrorists again. What I will never understand is why Cair is allowed to be in the US at all? Its well known who and what they are but they are still here secretly funding Hamas and none of the our reps or senators seem to care at all. This is one of the reasons I feel more like our government is run more like a crime syndicate that a government for the people.